Informality – a Blessing or a Curse? Governments (and donors alike) don’t like dealing with informality. It’s messy, dirty, essentially unmeasurable, and its character varies dramatically. From one industry to the next. From one city to the next. It’s also beset with fiendishly difficult problems – informal firms are often household enterprises (employing mainly family labour, and not hired labour). Thus, they have to make impossible trade-offs between production and consumption. And yet – the size and the importance of the informal sector in most countries shows no signs of abating. On average the informal share of employment ranges from 24 per cent in transition economies, to 50 per cent in Latin America and over 70 per cent in sub-Saharan Africa. In India, employment within the informal sector is growing, while that in the formal sector remains stagnant. Yet - very little is known about the relationship, whether symbiotic or competitive, between the two sectors. In a new paper, I notice that in India formal firms tend to cluster with informal firms – especially in industries like apparel, furniture and meal-making. The firms coagglomerate not only so that they can buy from and sell to one another – but importantly, also because formal firms tend to share equipment with and transfer technical knowledge to their informal counterparts. Such technical and production spillovers are found in clusters of domestic-foreign, exporter-non-exporter and high-tech-low-tech firms. It is no surprise then that formal and informal activity could be complementary. Informal can also be an outlet for entrepreneurial activity, especially in places with high levels of corruption, or where formal firms are often mired in complex regulations. This coagglomeration, or co-clustering, can have positive knock-on effects for formal firms. In India, I find that formal-informal coagglomeration leads to an increase in entrepreneurial activity in the formal manufacturing sector – specifically for small and medium enterprises. This could be a function of labour market regulations in the formal sector, or simply because SMEs find it cost-effective for other reasons to outsource production. Similarly, Ejaz Ghani and his co-authors find that output and employment is higher in places where presence of informal suppliers is greater. Research in Kenya and Nigeria suggests that large informal firms also benefit from subcontracting with formal firms. These findings suggest that policies that try to limit the development of informal activities and attempt to shift the balance to formal activities might be fraught with danger. It might be efficient to allow these clusters to grow. There is no reason to assume that informal firms don’t benefit from clustering with one another. In the absence of access to formal credit facilities, or alternatively since they are untouched by changes in regulations, buyer-supplier linkages and informal networks of social interaction could be more important to informal firms than to firms operating in the formal sector. Research in India indicates that informal entrepreneurial activity tends to favour regions where incumbents enjoy input-output linkages. In fact, the existence of female-owned informal firms is the strongest predictor of new female entrepreneurial activity. In their new paper, Louise Fox and co-authors argue that almost half of new jobs in sub-Saharan Africa will be generated within the informal sector (the remainder distributed between the formal and the agricultural sector). Research in India shows that informal enterprises help increase female participation in the labour force. In fact, agglomeration and urbanization are associated with the growth of informal activity, both firm entry and job creation. Is informal then the new normal? Given that job creation is of paramount importance to political leaders, much more evidence is needed – first, on how informal activity contributes to employment and growth directly, and second, how formal-informal linkages lead to positive spillovers. If informality is an important input to the formal production process, then it ought to be seen as a help, and not a hindrance, to growth. In Tanzania business which is associated with aggriculture activities is opperated informal. For example poutry and vegatable producion is operated informal and employs and genarate big profit which is not known. Thank you for your comment - and yes, I agree. A large majority of agricultural production in developing countries is often informal, which is not to say that it is not profitable, productive or welfare-improving. And indeed, these informal activities are often important inputs into the formal sector. i found your editorial interesting. but i am a bit troubled about the approach toward corrupt economic.in resource rich country low income countries sme find it hard to thrive not just becos of the high cost of capital but also because such business linkages tend to be bureaucratic (emphasizing on protecting insider) such factor could be attributed to stunted productivity growth because the business consideration aren't always aimed at adding or generating value. but i would see the very high level of informal sector as a result of short sight macro-policies even though population its attributes. Dear Leo - thank you for your comment. And yes, I would tend to agree. That informal firms are not unprodutive per se, but simply below the radar because of the costs of formalization. And thus, the imposition of high costs of operating a business would indeed be a factor that drives firms to become informal, forcing them to operate below their potential. "That informality in Nigeria should be allowed to grow on its own and try to formalise it is dangerous"
May be you need to go back to the variables and check again. Its unreasonable even put Nigeria in this report because I do not see anything coherent here..
Hi Ola - research shows that informality is not the cause of the problem, but simply the way that firms react and survive in difficult business environments. In stead of trying to get rid of existing informal clusters, which might be adding economic value in terms of output and employment, the argument is that policy makers ought to consider informal firms as productive actors within the economy and pay attention to why informal firms operate the way they do. Thank you for your comment. The use of messy and dirty -- even if meant to allude to immeasurable demonstrates lack of cultural competence. Dear Anonymous - my choice of words to describe the informal sector is not meant to offend, but simply to describe the difficult conditions under which these firms manage to survive (and grow). Thank you for your comment. Very nice blog. I agree with your point that "instead of trying to get rid of existing informal clusters, which might be adding economic value in terms of output and employment, the argument is that policy makers ought to consider informal firms as productive actors within the economy." This is a point that we also make in our recently released "Youth Employment in Sub-Saharan Africa" report. One comment about a key difference between Sub-Saharan Africa (SSA) and India which surfaced in our work. While informal household enterprises in SSA often have supplier relationships with formal firms, they almost always sell to households, not firms. Subcontracted home-based production for larger formal firms simply doesn't exist in SSA but is common in Asia. I suspect that the lack of linkages on the production side has to do with (a) unfriendly urban policies toward this sector in SSA, which inhibits the clustering, and (b) low urban densities and poor transportation networks, which inhibit the development of supplier relationships. 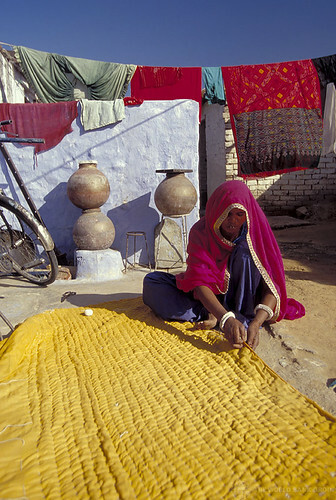 While many express concern about earnings and income security in this sector, the fact is that SSA countries seeking to promote sustainable employment and inclusive growth need to increase the number of enterprises and their productivity, including by encouraging the types of backward linkages found between formal and informal activities found in Asia. Hi Louise - I couldn't have expressed this better! Not only is it important to have a better understanding of the links between formal and informal activities (whether households and/or enterprises), but also to delve into the differences within and across urban regions driving productivity and other outcomes. The lack of data and information on the informal sector in most countries doesn't help, but in some of our work on urbanization in Africa we're ploughing ahead anyway. Thank you for your comment and terrific ideas, Megha. Thanks for the insightful article. The informal sector seems quite large in developing countries like Kenya. What is your proposal with regard to raising income tax from this sector so as to reduce the tax burden on formal sector employees? Hi Joseph - thank you for your comment and question. I don't see firms (whether formal or informal) simply as tax-revenue-generators. If we care about poor households graduating into middle-income status, firms should be given an opportunity to grow so that their employees have stable jobs, and thus, incomes. Becoming formal is an opportunity for firms to graduate from micro to small to medium and finally to large status - owing to greater access to credit, production linkages with larger firms, exporting and so on. Tax revenues ought to follow.